Italy Roundtable: Why do we love Italian hill towns? A ready-made topic for the Italy Blogging Roundtable in March didn’t seem to be presenting itself, so I went back to the topic brainstorming document I had started months ago and pulled HILLS/MOUNTAINS from it as an option. It was decided, and then I realized I had no idea what I had to say about hills or mountains in Italy. Why do we love Italian hill towns? There are countless articles, online and off, on the many hilltop villages throughout Italy that deserve a traveler’s attention, and a few discussions of why so many towns in Italy are built on hills. But Italy is certainly not the only country with hilltop villages – indeed, there are towns built on top of hills in countries all over the world. So, why are we so infatuated with the hill towns of Italy? Wikipedia actually defines a “hill town” as the same thing as a “citadel town,” saying people built cities on hills to make them easier to protect and harder to invade. Many Italian hill towns still have remnants of their fortified city walls, further emphasizing this fact. Today, of course, Italy’s hill towns aren’t being attacked by anything but tourist crowds. Certainly, one of the appealing elements of hilltop towns is that they tend to maintain their history. Modern cities built on flat land can (and do) sprawl in all directions, while there’s only so far a hilltop village can go before it’s quite literally over the edge. In fact, many historic Italian hill towns have forcibly relocated residents to new towns built nearby (not on hilltops) as local government officials feared whole pieces of buildings would fall off the edges of town. 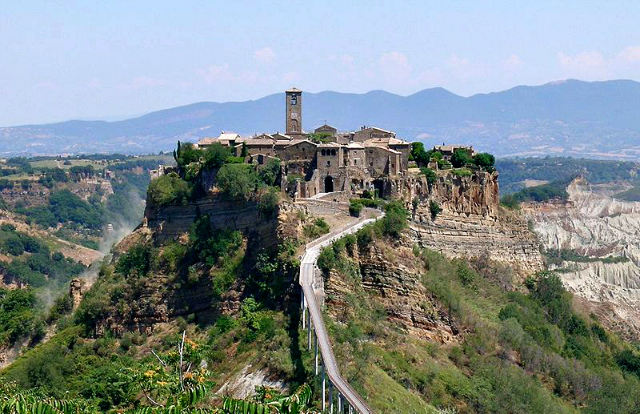 Rick Steves’ favorite Italian hill town, Civita di Bagnoregio, extended a footbridge from the new town (also called Bagnoregio) to the old town, which means residents can remain in their homes and tourists can still enjoy the peace and quiet of the tiny car-free town. There are precious few year-round residents in Civita di Bagnoregio these days, and there is some talk of shoring up the buildings that are most at risk of crumbling, but anyone who knows about Italian construction timelines knows not to hold out much hope for that happening anytime soon. 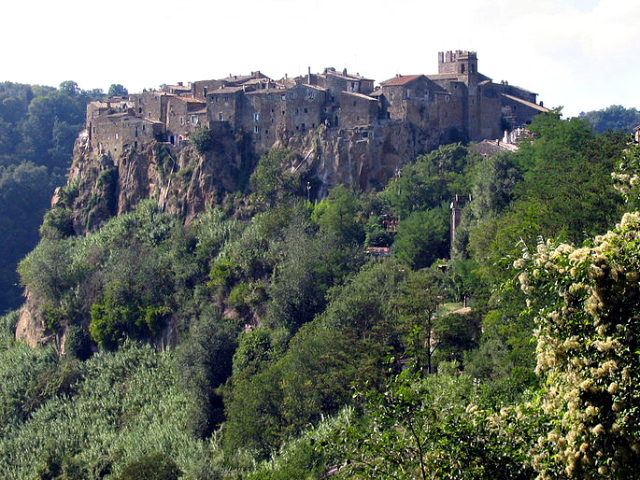 The hilltop town of Calcata, which serves as the setting for my friend David Farley’s fantastic book, “An Irreverent Curiosity: In Search of the Church’s Strangest Relic in Italy’s Oddest Town,” was condemned in the 1930s. A new town, Calcata Nuova, was built nearby, and residents of the old town were moved into new homes. Today, however, Calcata is once again home to a community of year-round residents – only now they’re largely foreign “artists and hippies” who started arriving in the 1960s. No doubt they found the abandoned town appealing, what with its distinct lack of government oversight, although years later the government rescinded its earlier condemnation of the historic town. The ancient section of the Basilicata town of Matera, built across a canyon, is so historically unchanged in its more than 9,000 years of constant occupation that it was used as the backdrop for the film, “The Passion of the Christ.” The popular Tuscan hill town of San Gimignano is noted for the many medieval towers (each built to show off a family’s wealth), several of which remain standing today. And some Italian hill towns have even been studied to find out how their ancient buildings survived earthquakes that leveled more modern buildings nearby. Some hilltop towns use their elevated status in singular festivals that sound too crazy to be real. Montepulciano hosts an annual uphill wine barrel-rolling race, during which participating teams of two run a little over a mile uphill along the town’s main street while pushing a 175-pound wine barrel in front of them. And lest you think this is a modern invention to attract tourists, the race actually dates back to the late 14th century. Of course, not all hill towns in Italy are small towns, either – Rome is famously built on seven hills, although the legend of the city’s founding goes back to one specific hill. The sheer quantity of Italian hilltop towns isn’t surprising, given how mountainous Italy is, but the question of why we as visitors are so enamored of these hill towns remains. Do we appreciate their relative quiet compared to the more-easily-accessed cities? Do we marvel at the historic surroundings that really do feel like they’re taking us back in time? Do we just like the commanding views afforded by higher elevations? Maybe it’s a combination of all these things – or something else altogether. I’m genuinely curious now – what do you like about Italian hill towns? And if you have a favorite, what is it – and why? 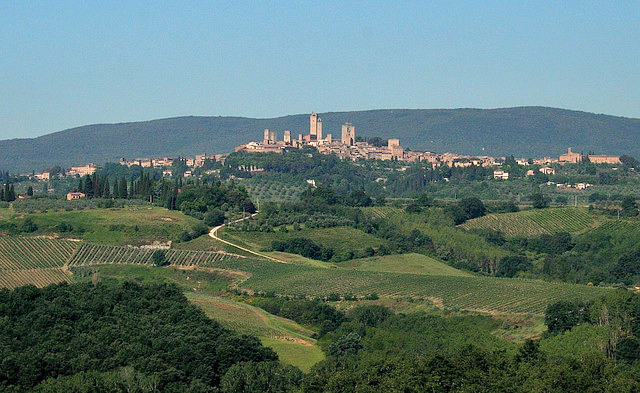 What Italian HILLS or MOUNTAINS are my fellow Italy Roundtable bloggers talking about? Let’s find out. 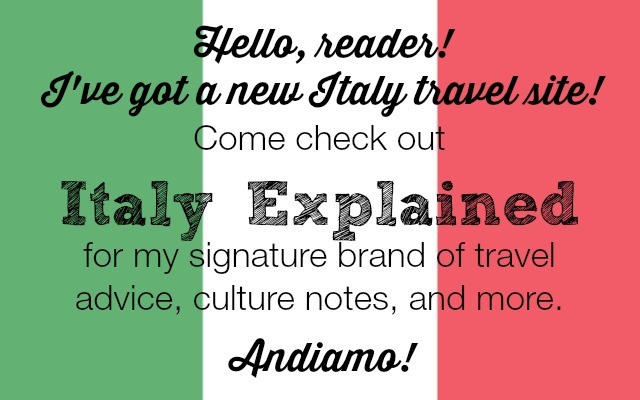 Click along with me through to the following links to read each of their posts – and please leave comments, share them with your friends, and tune in next month for another Italy Blogging Roundtable topic! Have you LIKED us on Facebook? Are you following us on Twitter? Please drop by and say hello, we’re quite friendly. And we’re always taking suggestions on future topics for the Italy Blogging Roundtable! Drop us a note on Facebook or Twitter, or leave a comment on one of our posts. Hilltop villages are an essential component of sustainable agriculture. Defense is a distant second consideration. In Italy, the water source is snowpack at high elevations, water tables in foothills at lower elevations is near the surface. Artesian springs and shallow wells can be found on hilltops. Within the towns, water makes its way from the heights along with waste to surrounding lowlands where the water irrigates and waste nourishes the soil. The outcome is continually revived soil fertility and good crop yields. 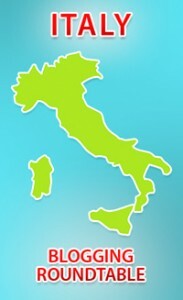 Keep in mind, Italy has been continually farmed for thousands of years, the villagers must be doing something right! Also, animals/livestock can be driven uphill, as the animals climb they represent a very low cost energy flow against gravity.